The research was published in December as an article titled “Integrated Assessment of Shallow-Aquifer Vulnerability to Multiple Contaminants and Drinking-Water Exposure Pathways in Holliston, Massachusetts,” in Water, an online, open-access journal. 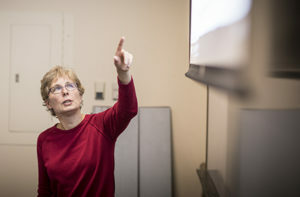 Yelena Ogneva-Himmelberger teaches a GIS class. Thirteen of the study’s 16 authors have ties to Clark University, including Downs, Yelena Ogneva-Himmelberger and Marianne Sarkis, all faculty in Clark’s International Development, Community and Environment (IDCE) Department; nine of their students; and alumna Allegra (Anderson) Denehy ’95, a concerned mother in Holliston. The project began in 2013 when Denehy called researchers at her alma mater. She was joined by two other Holliston mothers, Marcie Randall and Nichole Cordon. They also are co-authors on the study. Denehy’s daughter, Tessa, was born with only one kidney, and had been diagnosed with autism and epilepsy. Cordon’s daughter had open-heart surgery as an infant. Other children in Holliston have kidney problems, and some have rare chromosome 18 abnormalities (Trisomy 18). “The more people I talked to, the more people we found who had weird or unexplained medical (issues), especially kids,” Denehy recently told The MetroWest Daily News. 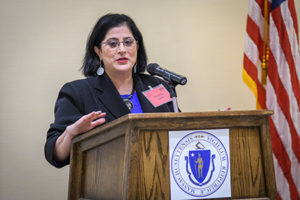 Marianne Sarkis speaks at the State House recently. Sarkis, who has a background in community-based health research, worked with Clark students to organize “listening sessions” with Holliston residents. Many wondered whether their children’s health issues were connected to water or pollution issues. 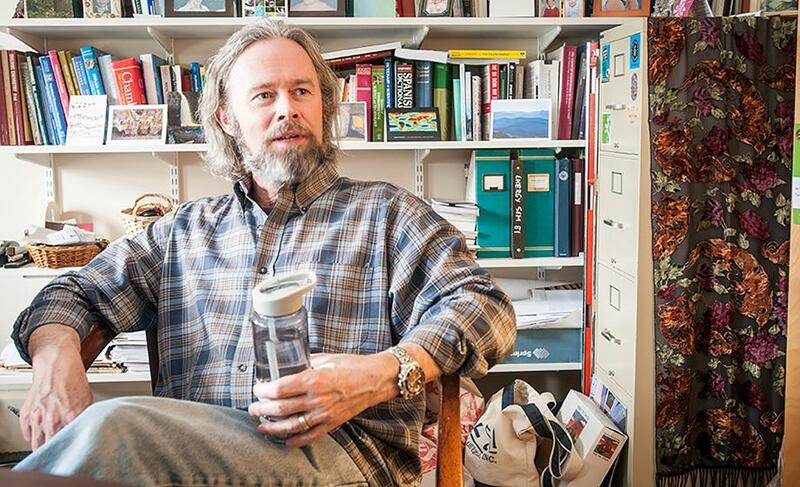 Downs brought to bear his background in risk analysis, environmental health, hydrology, and civil engineering. Ogneva-Himmelberger added expertise in geographic information science (GIS) and mapping of health and environmental issues. Holliston’s drinking water is drawn from very shallow aquifers – water-bearing soil/rock layers 40 to 50 feet thick atop granite bedrock ledge. The residents pointed researchers to five polluting sites in town, and noted complaints about discolored tap water. Like many New England towns with similar aquifers, Holliston has naturally occurring, moderate-to-high levels of the metal manganese in its groundwater. As a result, the tap water often runs brown in certain areas of town, so the public works department tries to remove manganese — but does not always succeed. The U.S. Environmental Protection Agency classifies manganese as a “secondary contaminant,” and it is currently regulated for aesthetic, not health, reasons, Downs notes. Yet manganese has been classified as an “emerging contaminant of interest” by the EPA, which issued a health advisory in the mid-1990s to advise that infants and children avoid exposure to high levels, Downs adds. The Clark team wanted to know more about manganese’s effects on human health, so they recruited Birgit Claus Henn, an environmental epidemiologist and assistant professor of environmental health in BU’s School of Public Health, for their team. Pointedly, she has linked exposure to manganese — during pregnancy and early life — with deficits in children’s cognitive and behavioral neuro-development. The five sites profiled include a waste transfer station; a combustion research center that tests fire-extinguishing/flame-retarding equipment and materials; the Axton Cross Superfund site; a private hazardous waste disposal site; and Lake Winthrop. Collectively, several “contaminants of interest” were identified, including mercury, trichloroethane (TCA), trichloroethylene (TCE), lead, arsenic, chromium and 13 other contaminants considered to pose risks to human health if exposure is high enough. The Holliston case brings to mind famous water-contamination cases depicted in movies like “Erin Brokovich” and the Woburn, Massachusetts-based “A Civil Action.” Those cases dealt with single sources and chemicals compromising aquifers: Woburn pointed to TCE from a tannery, while Brokovitch identified hexavalent chromium from a utility company. The Holliston case – with its multiple sources and contaminants, one of them naturally occurring – “reflects complex multiple and mixed exposures that may be more common that we think,” according to Downs. The researchers’ focus on aquifers has already drawn the interest of other communities, in and beyond Massachusetts, and a new effort with Uxbridge is beginning. Contaminants do not have to flow directly into a well to threaten human health, Downs explains. Capture zones (the zone of the aquifer/groundwater around a well captured by that well) and aquifer recharge zones (land areas where infiltration of precipitation replenishes underlying aquifers) need protection from pollution. Regulations are supposed to protect these zones, but Holliston shows that they fall short. “If you have a polluting source, and it’s in the capture zone, we worry,” he says. The goal of this first phase was to explore aquifer vulnerability and exposure pathways, and it was concluded that “complete [human] exposure pathways” for several chemical are plausible. The authors state, “This case questions the adequacy of aquifer protection and monitoring regulations, and highlights the need for integrated assessment of multiple contaminants, associated exposures, and health risks.” Follow-up work has begun to look at health risks. The study has garnered media attention, and has divided the town, whose divergent views can be seen on two Facebook groups: “Holliston Happy” and “Holliston Crabby.” Residents — a mix of long-timers and newcomers — have come to meetings with researchers and town officials. A state legislator has also become involved. 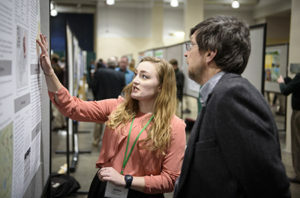 Spring Pillsbury ’17, one of nine IDCE students who are co-authors on the Holliston study, presented her research at last year’s American Association of Geographers 2017 Annual Meeting in Boston. She is currently a student in Clark’s M.S. Program in Environmental Science and Policy. Now the researchers are starting a pilot health study involving 30 families in the Holliston area, with seed funding from BU and Clark’s Mosakowski Institute for Public Enterprise. They also plan to seek funding from the National Institutes of Health and foundations for a more complete health study. Students in Clark’s Environmental Science and Policy Program in IDCE also contributed to the study: Bilin Basu, M.S. ’15; Brian Caccavale, M.S.’17; Stefanie Covino, M.S. ’15; Ravi Hanumantha, M.S. ’18; Kevin Longo, M.S. ’17; Ariel Maiorano’15, M.S. ’17; Spring Pillsbury ’17, currently a student in Clark’s Accelerated B.A./M.S Program in Environmental Science and Policy; Gabrielle Rigutto ’16, M.S. ’17; and Kelsey Shields, M.S.’15.